Your job opening will be posted in the Career tab of the AFP San Diego web site. Your ad will be accessible by nearly 400 AFP San Diego members. The Career Opportunities section is an AFP San Diego Member Benefit. Membership is determined by the AFP San Diego office. If an individual of your organization is a member, your organization -- for the position announcement service only -- is considered a member. Please e-mail your job posting information in a Word or PDF document to Katie Gomez at katiegomez@afpsd.org. Paid positions will be posted within 2 business days. *Important* Your position announcement will not be posted until receipt of payment. You may pay by check or by credit card. To pay by credit card, please call Katie Gomez at (760) 518-0776. All position announcements are posted on the AFP San Diego Job Center for 90 days. 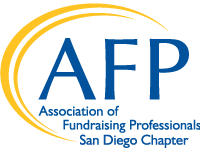 Position announcements are also distributed via e-mail in our Hotsheet to current AFP San Diego members who have opted to receive these notifications - approximately 350 fundraising professionals in the San Diego area. Pre-payment is required to process a position announcement with AFP San Diego.